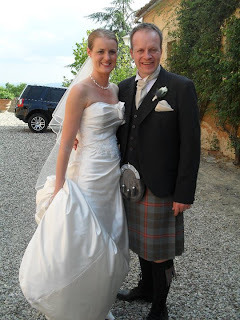 The reason we went to Italy was for the wedding of our friends Helen & Nick, where I was a bridesmaid. Helen was one of my bridesmaids too and I was honoured to be able to be there for her special day, especially since it was only four months after our wedding. The preparations started with us having a meeting at the hairdressers on the Tuesday, a drink in the main square in Siena before meeting all of the other wedding guests for dinner back near the villa. We had a gorgeous Italian meal before the members of the wedding party were presented with gifts; the bridesmaids all got a gorgeous necklace and matching earrings to wear at the wedding. They were all slightly different so mine had pearls alongside the silver design. Afterwards Helen, me, the other two bridesmaids Lucy & Nic, and Helen's mum went back to her room to enjoy a glass of champagne and make the last minute arrangements for the next morning. We ended up enjoying a couple of glasses before we went back to our apartment to get our stuff ready for the next day. We woke bright and early to start getting some of our make-up done before we went for out appointments at the hairdressers. Helen's dad and Graham drove us into Siena then we had a short walk into the centre. We had quite a relaxing time at the hairdressers as we waited for everyone to get their hair up. Once we got back to the villa it was time for Helen to finish off our make-up then for her to get started on doing her own. At lunch time the groom surprised Helen with a basket of yummy food for us all to eat. All too soon it was time to get dressed. 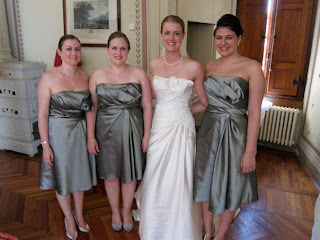 The bridesmaids got dressed first, helping each other with our dresses so that we could then help Helen. Like me, Helen hadn’t shown anyone except from her mum the dress so it was lovely to finally see it, a gorgeous ivory satin strapless dress with detail to one side. We helped get Helen get in to her dress along with her mum, and I took over finishing of the corset and buttons, to make sure it was tight enough. The last things to put on were Helen’s veil and shoes then I packed up her bag, almost ready to go. The photographer had arrived while Helen was getting ready to take a few shots of her dress and getting ready. Doesnt Helen look gorgeous! Once Helen’s dad arrived we were able to take a few photos of us altogether before we had to leave our cameras with the boys; they were running a little late trying to get themselves and Lucy’s daughter Emily ready. We saw all of the guests making their way towards the bus, hiding up in the villa so no one could see us. There was a threat of rain but after a few spots it stayed away for the rest of the day. The cars arrived and we all got settled in to our car along with Helen’s mum, leaving Helen and her dad to follow. Although cars are not normally allowed in the centre of Siena, the two wedding cars had special permission and we arrived into the main square into a massive crown of tourists, all waiting to catch a glimpse of the bride! The groom, best man and guests had all walked into the centre of Siena, following the piper which had attracted a lot of attention along with all the men in kilts. 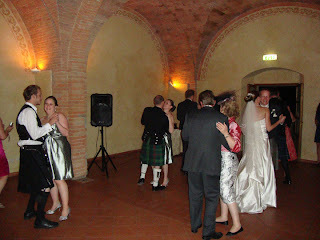 We lined up outside the ceremony room, with loads of tourists looking on, before the bridesmaids walked in one by one. I sat beside the best man on the right while Lucy and Nic sat on the other side. Helen and her dad walked down the aisle behind us, to where Nick was waiting. The ceremony was conducted in Italian then translated by their wedding planner. It was a very emotional ceremony, especially during their vows and while the grooms mum was doing her reading. After they were pronounced man and wife the bride and groom made their way back up the aisle followed by the bridesmaids then the rest of guests. We came out into the waiting crowd of tourists who were visiting the town hall. While Helen & Nick got some photos taken inside the town hall, the guests waited outside and made two lines for them to walk out into. We were distributed with rose petals which were thrown on them as they made their exit into the square, following the piper. We had a few more photos taken in the square then the bride & groom went off to get some photos taken around Siena. The bridesmaids waited for their car and the rest of the guests circled the square following the piper then made their way back to the bus. On arrival back at the villa we waited for the bride and groom to arrive and congratulate them, before we got some photos taken. Afterwards we were led into the garden where the aperitivo was to be served and the harpist was playing. We were greeted by a fantastic sight; tables upon tables of gorgeous Italian cheese, meat, bread and many other things washed down with a few glasses of prosecco! It was really hot so a few glasses of water were required at the same time. When it was time for dinner, we were called through to where the tables had been set up; overlooking the gorgeous Tuscan countryside. The four tables were each named after Italian wine and we were sitting a Chianti. Each of the three guest tables had one bridesmaid on each which was a lovely way to make each table important. The speeches happened before dinner and all three were fabulous and very touching. Then it was time to tuck in to our five course meal! We started with a cheese soufflé with a pear compote & truffle; followed by two pasta courses, squid ink pasta with cherry tomatoes & king prawns then pici with wild boar sauce; this was then followed by the main course of quail, onion stuffed with potato and green beans & carrots wrapped in prosciutto; the meal was completed with the wedding cake. I never actually took any photos of the food but trust me when I say it was all delicious, especially the squid ink pasta! After the first 4 courses we had a little break and then the massive cake was brought out for them to cut. They had a traditional two tier Italian wedding cake with loads of different kinds and colours of fruit on top. We all got more of it to eat the day after. To complete the day we headed inside to one of the buildings at the Fattoria for the dancing. Their first dance was to Al Green’s Lets Stay Together and their parents and the bridesmaids joined them on the floor. After lots more drinking and plenty of dancing (I changed into my flat shoes after the first dance) we finished off the party signing That's Amore! Afterwards, we dragged all of the chairs outside and continued the party way into the early hours; I think I finally made it to bed at 6am, with me and the bride the last ones up! It was a fantastic day and we were thrilled to be part of it. 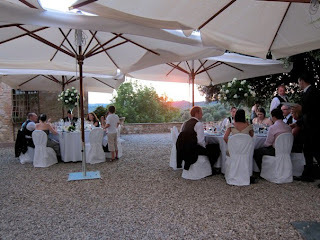 I would thoroughly recommend attending a wedding in Tuscany if you get the chance! p.s You can read a bit more about the wedding on the wedding planners blog here. She looks beautiful and so do you! What a lovely wedding! I love Italy, too. You all look beautiful. The tourists must have been thrilled to be in the square with the wedding and the piper. How lovely you all look! Love your dress G! It all looks so beautiful! What a stunning location for a wedding! Looks like an awesome wedding and the bridesmaids were all very pretty! And kudos to you staying up to 6am!